Computer power supply troubleshooting is indentifying the power unit as a reason for the problem of a computer system. The power unit is one of the main parts of a computer system, which is responsible for supplying the required power to the whole PC system components. The power supply converts the wall electric power of 120V or 240V AC into different DC powers. These powers include 12V, 5V and 3.3V. This is because not all parts of a computer need the same power. For example, the +3.3V is used by chipsets, PCI cards, memory chips were as the 12V power is consumed by disk drive motors and fans. 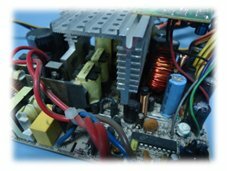 In this article, we will see the major symptoms of power unit failure and some information and tips helpful for computer power supply troubleshooting. How do you know that your PC power unit failing? As we have discussed above there are ample reasons for the failure of power supply unit. Depending on the level of the failure, it can be fixed or replace it with a new one. Actually, it is better to replace with a new power unit than trying to repair it, particularly if the failure is severe. Because most of the parts in PC power unit are not serviceable. Even though it has some serviceable parts, you should have knowledge about electronics. It also requires some test equipments and tools to carry out the repairing. The only part that can be replaced at user level is the FAN. Indentifying fan problem is easy; it does not spin when you switch on your PC. Despite the failure of the fan, the power unit can still work without it, but the unit stays for a limited time and forces the PC to shutdown due to overheating. In this case, you can replace the fan with similar spec taken from old malfunction power unit or purchased from PC store. Recently, I did this type of maintenance and the power unit is working fine. -	Check that your country wall electric power supplies is 120 V or 240V; so that you can adjust your power unit to the corresponding switch, otherwise you will burn the power unit. This was happened to my computer. -	Indentify the part that lead to power failure by hooking the parts one by one If you cannot fix the power supply, replacing with a new unit is the last option. However, before going to purchase a new unit, make sure the form factor, input/output power, physical size, shape, direction of fan and screw hole positions are similar to the old power unit. Shutting down and unplugging your computer equipment after working is the primary step to prevent power unit failure. In addition, there are devices designed for the protection of computer parts from power related problems, these devices include surge protectors and UPSs (Uninterruptable Power Source). How to upgrade computer memory? I promise to use it ONLY to send you PC Tips.